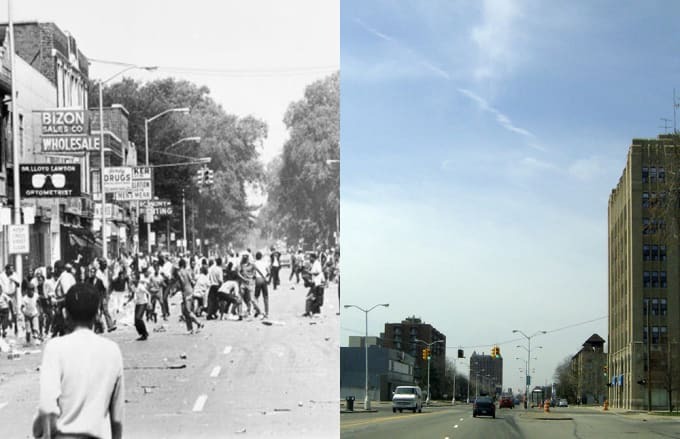 The 1967 Detroit Riot, also known as the 12th Street Riot, remains one of the worst in the history of the United States. Taking place in the predominantly black inner-city of Detroit, the five-day riot resulted in 43 deaths, over 7,000 arrests, and the destruction of some 1,400 buildings. 7,000 National Guard and U.S. Army Troops were called in after police clashed with residents following the raid of an illegal after-hours spot on 12th and Clairmount. Though Detroit had been regarded as a leader in race relations during the early '60s, African-Americans in the city were largely unsatisfied with issues similar to those afflicting the rest of the nation: employment, housing, education, policing, and segregation. On the evening of July 23, 1967, the city reached its breaking point. Since the riot, 12th Street has been renamed Rosa Parks Boulevard, and the destroyed stores have been replaced by housing and a park. A sculpture there is the lone, yet unofficial nod to the riots of 1967, which are beaten in scale by only the New York City Draft Riots and the Los Angeles Riots of 1992.